BILLINGS — Cold temperatures and high winds kept many south central Montana hunters at home or near their vehicles for the closing weekend of the five-week 2014 general big-game season. Those who weathered the elements did well, however, as the percentage of hunters who brought animals to Montana Fish, Wildlife and Parks check stations was better than during the same weekend in 2013. At Columbus, hunter numbers were similar to the final weekend of 2013, but the mule deer and elk harvests, as well as the percentage of sportsmen with game, were higher. FWP wildlife biologist Shawn Stewart checked 184 hunters Saturday and Sunday, up just two from the same weekend in 2013. Those hunters had 23 white-tailed deer – up two from last year – and 38 mule deer – up 46 percent from the 26 checked in 2013. The elk harvest remained strong with nine coming through the check station compared to just one last year. Of those who stopped at Columbus, 38 percent had harvested game, up from 29 during the closing weekend of 2013. After a slow start to the general big-game season, hunter numbers and the percentage of hunters with game picked up for the final weekend at the Laurel check station. FWP wildlife research specialist Jay Watson checked 120 hunters over the weekend at Laurel – down from 174 for the close weekend of the 2013 season. Those hunters had 27 white-tailed deer – up from 16 last year – and 19 mule deer – down from 30 in 2013. Hunters checked three elk, up from one last year. For the weekend, 41 percent of hunters who stopped at Laurel had animals compared to 27 percent a year ago. At Big Timber, FWP wildlife biologist Justin Paugh checked 208 hunters with 35 white-tailed deer and 27 mule deer. During the final weekend of the 2013 season, 220 hunters stopped at Big Timber with 35 white-tailed deer and 37 mule deer. The elk harvest remained strong with 20 animals checked over the weekend compared to 14 on the same weekend last year. 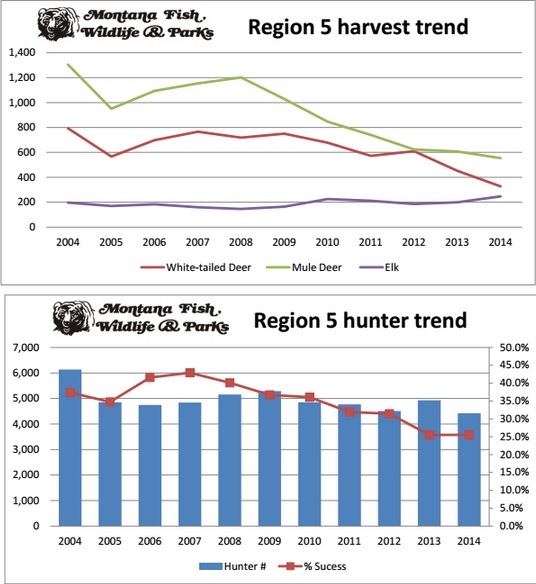 Hunter success was the same as the final weekend in 2013 with 39 percent of hunters harvesting game. At Lavina, the number of deer and elk checked over the weekend were similar to last year, but the number of hunters was down substantially from the 2013 closing weekend. FWP wildlife biologist Ashley Taylor reported that 355 hunters stopped Saturday and Sunday, down from 508 on the same weekend last year. 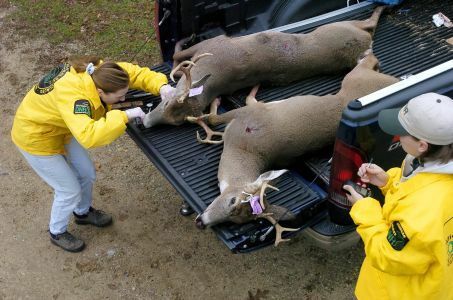 Of the hunters who stopped, 29 percent had harvested animals, compared to 20 percent in 2013. Hunters checked 22 white-tailed deer – the same as in 2013 – and 49 mule deer – one fewer than last year. The elk harvest remained strong with33 checked, compared to 30 in 2013. The white-tailed deer harvest was 66 percent below the long-term average while the number of mule deer checked on the final weekend was 76 percent below average. The numbers were expected since fewer deer B tags were issued this year because of a dip in populations.